ALavandhAr enjoys SrI sEnApathi AzhwAn‘s (vishvaksEna) dhAsya sAmrAjyam (kingdom of servitude) where emperumAn placed all his responsibilities on vishvaksEna and places himself under the control of vishvaksEna. One (vishvaksEna) who eats the food remnants of what you (emperumAn) ate, who is placed your burden/responsibility (of managing nithya vibhUthi (spiritual realm) and leelA vibhUthi (material realm)) by you, who is dear to all and you who approves off those actions in the same manner by your merciful glances, whichever actions requested in any manner by such vishvaksEna. 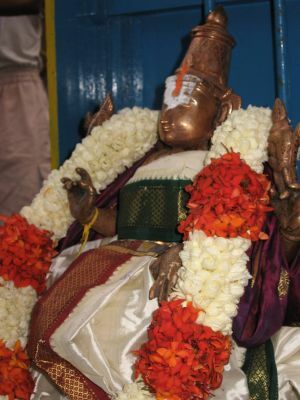 thvadhIya … – One who sustains himself by the prasAdham (food remnants) that were there after your highness ate. By saying “thvadhIya” (yours), it implies that the food remnants of the apt lord/master are only to be consumed. Since it is said in thaiththirIya upanishath nArAyaNavalli 38 “yadhuchchishtam abhOjyam” (those contaminated remnants which are forbidden from being eaten), it is clear that the remnants of others cannot be eaten [Not just the remnants of emperumAn, but remnants of pirAttis (emperumAn’s divine consorts), AzhwArs, AchAryas and exalted SrIvaishNavas are also greatly encouraged to be eaten, in AzhwAr/AchArya SrISukthis]. Since it is said as “bhuktha ujjitha“, as said in thiruppallANdu 9 “kalaththathuNdu” (eating off the same vessel or banana leaf), the food that is remaining in the vessel or banana leaf, is to be accepted with great reference. In the case of others, it is forbidden to accept food even from the main container from which others were served in individual vessels/leaves. SEsha bhOjinA – The food not only sustains him, but as emperumAn said in SrIpAncharAthram “rasAn bhakthasya jihvAyAm” (Oh brahmA! I relish the different tastes through my devotee’s tongue), the food becomes relishable for emperumAn only when sEnApthi AzhwAr accepts his remnants. thvayA nisrushta Athma bharENa – Hailed by your highness that “He is greater than me, more capable than me” and you have placed your responsibilities with respect to ubhaya vibhUthi (managing spiritual and material realms) on him. priyENa – very dear to all. sEnApathinA – As the commander-in-chief of everything, he is known as in thiruvAimozhi 5.8.9 “asaivil amarar thalaivar thalaivA” (leader (emperumAn) of the leaders (anantha, garuda, vishvaksEna) of nithyasUris). yath yathA nyavEdhi – At whichever time, whichever action was presented; ermperumAn neither sees whether is internal or external aspect; nor he sees in which manner it was presented; ISvara will simply follow his words. udhAra vIkshaNai: thath thadhAnu jAnantham – As said in SrIvishNu purANam 1.20.16 “avalOkanadhAnEna bhUyO mAm pAlayAchyutha” (prahlAdha says – Protect me by glancing at me again) and periya thirumozhi 7.1.9 “uyirkkellAm thAyAy aLiikkinRa thaN thAmaraik kaNNan” (Like a mother, the cool lotus-eyed emperumAn who protects all), it is through this merciful glance which is laden with infinite kind thoughts and care, emperumAn approves “Let vishvaksEna do it in this manner”. thadhAnujAnantham – emperumAn mercifully approves with confidence saying “Whatever the elderly statesman requested, let it be implemented in the same manner”. This entry was posted in Other, sthOthra rathnam on January 29, 2017 by Sarathy Thothathri.